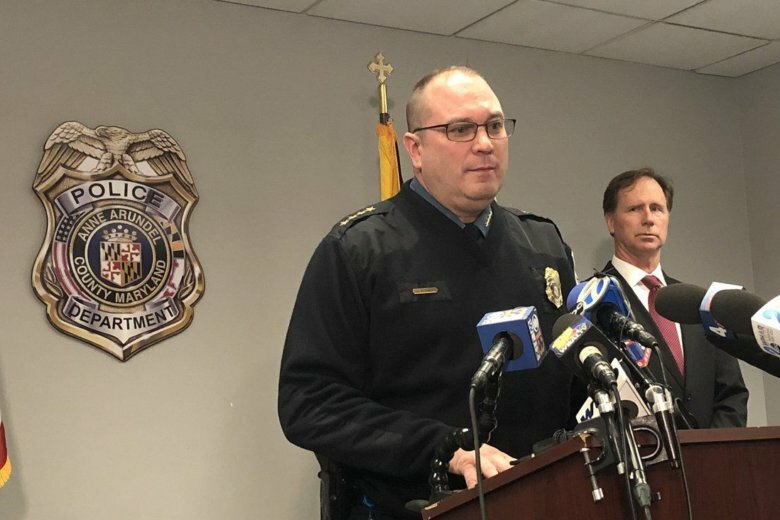 Anne Arundel County Chief Tim Altomare announces the arrest of 18yo Dillon Augustyniak of Jessup in the killing of sales rep Steven Wilson in a model home. Motive was robbery. Community tips made all the difference, leading investigators to arrest an 18-year-old in the killing of an Annapolis father inside a model home last week, they said. And, Anne Arundel County police are hoping that information from the community will aid them again in solving other homicides. WASHINGTON — Anne Arundel County police are hoping their community will help close six unsolved homicides. Community tips made all the difference in the arrest of an 18-year-old over the killing of an Annapolis father inside a model home last week, police said. They’re hoping information from the community will aid them in solving other homicides, too. In announcing an arrest in 33-year-old Steven Wilson’s killing, Anne Arundel County police Chief Tim Altomare turned his focus to six suspected homicides still unsolved this year. “In two cases, I’ve announced a $10,000 reward already. As we get closer to next year, I want to announce we’re putting $10,000 on every remaining case. I want to ask for the community’s help,” Altomare said during a news conference Friday. They victims are: Lawrence Aaron who was killed on Jan. 1; Jose Funes, killed on March 2; Dantae Simmons, killed on July 2; Jasmine Adams, who was killed on Aug. 15; Prateek Kumar, killed on Oct. 8; and Quenton Boykin, who was killed on Nov. 11. “We need people to talk to us in these six other cases. You just might have the puzzle piece we need to bring justice to another family,” Altomare said. Members of the public with information on any of these cases can contact the Anne Arundel police homicide unit at 410-222-4731, or submit an anonymous tip by calling 410-222-4700. Suspicious activity can also be reported online.